So - looking at a K1200R on Monday. I know these bikes 'somewhat', my ex wife had one for a few years (one of the first in to the UK IIRC), but I've never worked on one. Anything I need to be looking for? I've read that the quality of finish isn't brilliant, and that there can be issues with the bearings on the Duolever? Has anyone suffered from these? Cheers in advance for any comments. LOL remember when this section of the board was abuzz, following the release of the mighty K1200R. I was jonesing for the mighty K at that time, having test ridden a K1200R Sport and lusting after the motor. The long & lean package with Duolever seems perfect for road trips, although the factory cases from that era (same as early F800S/ST) are not as useful as our R1150** vintage kit. 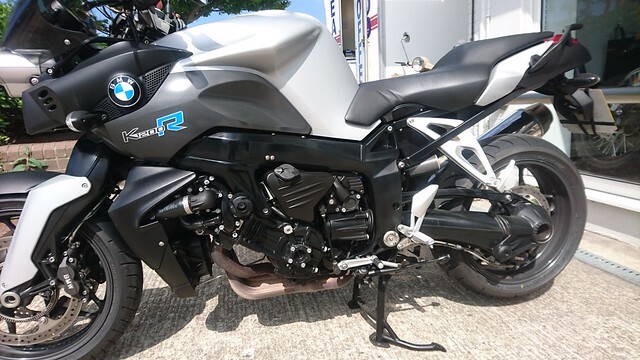 Wish I could offer some perspective and experience, but I'm just as curious as you regarding user experience for the iconic K-R.
k1200r is a fantastic muscle bike. One of my favorite style bikes as well. Ive found myself looking at them multiple times. However, they are not the most fun to ride slowly in traffic. feel "chunky"
only hearsay I heard from fellow riders at a rally for issues. Some folks had trans problems. then some very BMW-ish electronic stuff. Well, I'll be asking lots of questions.... just put £495 down on this little... ahem.... hulking great monster! 16K miles, 2006, couple of previous owners, but it's in very good nick for the year/mileage. 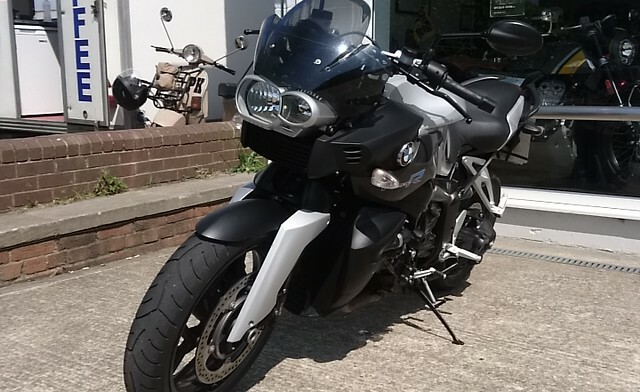 I've also got them to change the tyres - I don't like Bridgestones, so there's a new pair of Metzelers going on, and it comes with a years warranty and a service before picking up. Does anyone have a copy of the BMW workshop manual perchance?? What tyre pressures are people running? The T30s fitted wandered horribly even after they were pumped up to 36 properly (after my test ride!) That's why I asked for a pair of new Metzs. Anyone (in the UK) selling any luggage? James, I joined you in the ranks of K owners. I'ts been a bucket list item since college years. Purchased a used K1300S 2 days ago, rode 8 hours yesterday (4 hours in nightmarish Seattle stop & go traffic will burn the clutch feel into memory... if not the clutch itself), and will take it into the mountains today. It uses oil, need to put miles on to determine how much. But that motor! I was impressed during test ride on K1200R Sport when that model appeared, and the later mighty K does not disappoint. Eager to read about your impressions since purchase. I haven't been noting much on the forum, simply because I'm not sure if anyone would be interested (and I've not been on the computer daily either*). The steering Ball Joints have been replaced : this TRANSFORMED the bike for me - previously it would 'wander' when there was no input to the bike (ie no throttle, or brake input), even in long corners. This was NOT making me happy, when I test rode it, I thought it was the tyres (which is why I had them changed). I now need to essentially get used to the bike all over again. Also had the CCT replaced - the big K bikes have an issue where the CCT goes slack when the bike is cold, so the cam-chain is loose at startup (it makes quite a nasty noise) until oil gets into the CCT (it's assisted by the oil pressure). The new part retains that pressure (I assume in a resevoir) so the cam-chain is still tensioned for the next startup. I've also fitted my old top-box to the bike - I bolted it straight to the grab-handles and (so far) it's solid as a rock. If there's interest I'll do some pics. About the only other things I've done are : accessory wiring***, R&G crash bung on the swingarm (the oe BMW plastic cover fell off! ), and a mudguard extender on the front. * took a work 'sabbatical' at Easter so have been 'on holiday' doing various things. ** please let me know what you think of the site, I built it. *** PIAA relay switched loom which are linked to a KEIS heated gillet setup (with controller), and a car-type power outlet for a Brodit powered mobile phone mount, which is what I use for navigation and music (via a Cardo Scala G4 headset). NB: the Cardo Scala is so good, I've taken phone calls and the other person doesn't know I'm on a bike.